Each year, the end of summer is announced with a breath of cold air, a warning of frost, a rush to harvest what can be saved and the sizzle of green tomatoes frying in an iron skillet. Green tomatoes are no longer reserved for gardeners or dinners at bistros specializing in southern cuisine. Many grocery stores now carry the jade colored fruit much of the year. I've noticed they are particularly available around the holidays, which means this may be a good time for you to give them a try. The appeal of the fried green tomato lies in the salty, tart crunch that can serve as a vessel for any number of sauces. I prefer to dredge mine in a mix of corn meal and flour, though how you treat yours is entirely up to you. The real trick to fried green tomatoes is the patience require to extract as much liquid as you can from the sliced fruit. I prefer a method that reminds me of the apple drying that was once ubiquitous in northeast preschool classrooms at this time of year. I thinly slice the tomatoes, salt them liberally, then use a lobster poker to run a long length of trussing string through them. I then hang the slices over sink, an emerald necklace, for at least an hour, allowing them to drip. When much of the juice has been extracted and the slices begin to wilt, I dredge them in a 50/50 mix of corn meal and flour. I then refrigerate them for about an hour, on parchment paper, before frying them to a golden brown in olive oil. After removing them from the oil, let your treat drain on paper towels. Couple, few shakes of Old Bay seasoning. This story began when I was a child, and I first discovered a black swallowtail butterfly caterpillar in my mother's herb garden. It was the kind of finding that sparks awe in anyone intrigued by nature's colors, creatures and possibilities. My grandfather told me the many-splendored worms would turn into beautiful butterflies. And when a few weeks passed, I was delighted to see the creatures fluttering through the flower garden. As an adult, I've maintained an affinity for this member of the order lepidoptera. In fact, when I first planted my own herb garden, I decided I'd let the dill go to seed. Each year wanted more and more of the tall, spindly herb to grace my bed. This would leave enough for my potato salad and for the caterpillars. And each spring I have been rewarded by the appearance of the caterpillars, each year in increasing numbers. But this spring we decided to take things up one notch. Our two year old had caught the black swallowtail bug. Each morning, he would hustle out to the dill to see how "his" caterpillars were doing. After some discussion, we decided we would bring one caterpillar into our home, so that he could watch its growth and metamorphosis up close. It seemed to be going swimmingly. Twice each day I would bring the caterpillar new dill, and each day he would plow through my offerings, and leave me an ample harvest of caterpillar poo to throw back into the garden. He grew and he grew. And then, one morning he appeared paralyzed on a stick in his home. A day later, he'd become enveloped in his chrysalis. And the wait for the butterfly began. To make the wait more of an event, I placed the chrysalis on a skewer placed in a vase atop a bookshelf in our living room. There, I figured, we'd be sure to see it when it hatched. We'd also be right by the side door, to let the magnificent creature go free. So, each day, several times a day, we would check on its progress. Then, last evening, I noticed a hole in the side of the chrysalis. But there was no butterfly in sight. "Has anyone seen a butterfly?" I called. The search was on. Almost immediately, Callawassie, our cat, was indicted. But, not wanting to believe that she could have sacked the butterfly without our knowing, we continued to search. We looked in all of our windows, figuring it might go for light. I shook the curtains and peered behind the blinds. Then, above a living room window, I saw it crawling along the wall. But it wasn't a butterfly. It was a wasp. 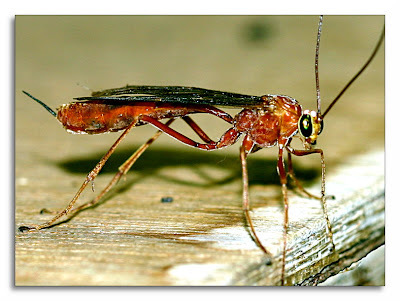 It was a long, thin, bright red wasp, with a set of jet black wings that served notice that it was one badass creation. I went into the kitchen and gathered a Solo cup and a piece of paper. I had to capture the creature. I had to get it the hell out of my house. The capture went well, but upon releasing the scourge, it flew directly at me. I screamed like girl at a Jonas Brothers show, then I leaped and spun so that the beast narrowly missed me. Bridget began to chuckle at my reaction, but then it landed on her leg, and she joined in my terror. After a few fleeting moments, the wasp, who I'm now sure was just thanking us for our hospitality, took flight into the Midwestern evening. We quickly lost sight of it. So, how is it that an ity-bitty-caterpillar grows into a big fat caterpillar, builds itself a home called a chrysalis, and emerges three weeks later a terrifying wasp? Well, that's nature. You see, our beloved caterpillar was eaten, mid-metamorphosis, by the spawn of a wasp who'd laid an egg on it, before we'd hustled it into our home for protection. As I was bringing dill to my future butterfly, it was likely being consumed from the inside out by the larval wasp. When it disappeared into it's shell that process just moved forward, and yesterday was the day, that Pop! Out came the scary, scary wasp. Not exactly the way Eric Carle wrote it, but Nature will do what Nature will do. It is the waiting time. The cool crops are gone. The tomatoes, zukes, and cucumbers are still at least a week away. If it weren't for the Swiss Chard, which continues to produce despite being cut back as much as two times a week, there would be little harvest in these oddly cool early July weeks. But it isn't the lack of current production that has me worried. In fact, I'm quite comfortable that in just a few weeks time, I'll be so loaded down that I'll be sending gift packs off to friends and neighbors. That is, of course, unless something tragic happens. The white flies have arrived. White flies represent a particularly heinous segment of Creation, at least from the gardener's point of view. They are tiny, snow white, insect that feasts on the pulmonary system of plants, having a particular taste for tomatoes. They are destructive in two stages of their lives. Both the nymphs and the adult flies delight in sucking the life out of tomato vines. Their population can also seemingly explode over night, allowing them to sweep over previously vigorous plants like a chalk scourge, and leaving them twisted, dessicated, and crippled. Making white fly an even a greater annoyance is that no one pesticide can kill both stages of the insect, at least not without posing an immediate and significant threat to other larger creatures, such as young bipedal hominids. So, when I noticed white fly attacking my dill this spring, I immediately feared their next target would be my tomatoes. I had to make a plan. I had to discover a non-poisonous way to control white fly. I had already ordered three praying mantis egg sacs to spread around my yard. My idea in ordering these guys was that they would have a chance to mature with my plants. I also hoped that having a few mantises around to stand guard over my zukes and squash plants, I'd be less likely to lose these plants to the hated squash borer. But in the weeks that had followed my placement of the egg sacs around my yard I had yet to see any mantises. And while I figured a young mantis may eat a few white flies, I also knew a larger one would prefer larger prey. So, I needed to find something else to help me with my white fly problem. By taking a close look at my dill, I got my answer. Well, I should say, by taking a close look at my dill and listening to my two-year-old, I got my answer. Because one afternoon when we were checking on the black swallowtail caterpillars that were living among our dill, he spotted something else. "Lady bug, daddy, ladybug!" At first I didn't see it, but upon getting on my knees to give myself his perspective, I spotted it, a lady bug and it was devouring the white fly. Now, because of my praying mantis order, I knew that the Montana-based Planet Natural also sold lady bugs. It was then that my father-in-law mentioned to me that his tomato plants were also being ravaged. I knew it was time. I logged on to the site and placed an order for 2,000 lady bugs to split between the two gardens. Well, yesterday they arrived, and after a quick summer storm that soaked our garden, the three of us went out to eradicate some white flies. Almost immediately our mission had an unexpected bonus. As Bridget began placing a few lady bugs on the zukes, she spotted our first praying mantis. It was tiny, only about an inch and a half long. But it was as still as a statue, and it was waiting for something, anything (maybe even a lady bug) to creep within its grasp. Confident that my zuccini were safe, I shifted my focus to the tomatoes and started shaking my bag of bugs all over my six-foot plants. Amazingly as they fell from the bag they were able to latch on to the leaves of my plants. Immediately they began their work of consuming white flies. Their technique it appeared is quite similar to that of the white fly, but instead of sucking the life from my plants, there were sucking the essense from the flies that were killing my plants. It may seem wicked, but this delighted me. We made the short drive to my in-laws and released hundreds more lady bugs there as well. There, too, they went straight to work. According to Planet Natural, each lady bug will be able to eat a couple hundred soft bodied insects each day. If I'm right, there are hundreds of thousands of white flies on my tomatoes. But my goal isn't truly to eradicate them all, for if all of them disappeared, so too would my ladybugs. My real goal is to restore some balance to my garden. The white flies can stay, but only in numbers that allow my tomatoes to grow, bloom and give fruit. The lady bugs will also add an interest for my young one, without the prospect of posioning him, which is also a plus. So, in this little garden the cavalry has arrived. Hopefully, the BLTs will be next. Dad, where does salad come from? It's not a real question. Or, should I say, it's not a question that I've been asked yet. And it is the kind of question that I'm working hard to prevent from ever happening. You see, having a child assist you in the garden has attributes that go so far beyond the money you'll save not buying salad-in-a-bag. Growing season is in full swing now. The patches that just a few weeks ago were bare dirt -- or more frequently were covered with snow -- are now bursting with green leaves expanding before the sun. There are the rows we planted, the salad mixes, the spinach, the carrots, onions, peas, and radishes. And then there are the volunteers, progeny of last year's ignored plants that went to seed. Our garden is full of them, sage, cilantro, dill, and even some lettuce. For my two-year-old, each, whether planted or volunteer, is a discovery. He is amazed at the subtle sweetness of baby lettuce, thrilled by the kick of chives, which he plucks by the fistful, and delighted by the menthol tickle of the mint he chomps. But there are also misses. He can't seem to understand why the radish greens are so bitter. He also wants to correct me when I address those vines crawling up the fencing as "peas," after all, there are no peas there, only leaves and tendrils. The garden has become an schoolyard. He attempts to count the rows of onions. He sounds out words like "spinach" and "weeds," which present him with a very challenging concept, one in which some of the plants must be torn from the earth, but others, the one's which, frankly are much more attractive and he'd much rather carry around, must be left in place. The plants in the garden are not like the toys in the toy box at all. They require patience. They require stewardship. They require gentleness. And, no matter how springy a particular plant may look, and how inviting a back row of something may be, stomping through the garden is just not allowed. Not for kids or Moxies, and, to be honest, that is just not fair. There are other lessons in the garden are well. The garden has visitors, like the robins. They like to sit on the peak of the house at watch him closely. Occasionally, one will come down to the garden, but they do not like being chased. Then there is the bunny, which always seems to be there when we first arrive, but quickly scurries away when he notices us in his midst. He lives on the other side of the fence, which for some reason, is a place neither he, nor Moxie, is allowed. Soon we will be able to harvest some of our spring crops. The radishes are quite close. The spinach is exploding. And then, he'll really begin to understand why it is that we spend so much time in the garden. All of that patience and caring, all of that gentleness and not stomping will be rewarded. But, in time, I hope he'll also discover that it's this time, the time of the growing, that really makes a garden part of a family. Across much of the nation, Spring 2009 has been the meteorological equivalent of a dead cat bounce. For those willing to be drawn in by a few days of warmth, the glow of spring blossoms, and the belief that warmer days really are around the corner, there has been just enough time to sink some seeds into the garden. But right around the time germination should be expected, February roars back with freezing temps, frozen precipitation, and commuters zipping up their winter coats to brave the chill. I've done a decent job documenting here what things have been like in Chicago. A quick trip to Facebook reveals status updates from the West Coast, Southeast and Northeast that show things aren't much different elsewhere. They offer takes such as "...wonders why it's snowing in April, in Georgia" and "...wants to know where the Hell spring is" and "...would appreciate it if Jack Frost would go on vacation already." Earlier this year I spoke with Rick Belding, the horticulturist in the Regenstein Fruit & Vegetable Garden at the Chicago Botanic Garden, about garden planning that could be done in the dead of winter. At the time, he told me that even here, in temperate Zone 5, a grower could get three full seasons of vegetables out of a garden. Of course that was before the first eight days of April failed to get a single day above 53 degrees. So, I decided to check in with Rick, to see how his garden is faring in the cool cruel near-spring. "We will commence planting today. We didn't want to plant when we knew nighttime lows would be below freezing," offered, immediately making me once again fear the fate of my peas, onions, spinach and lettuce. "Unless the temperature dips below the mid-twenties, spinach, peas and onions should survive." The extended cold has basically put everything in the garden on pause. This is a good thing, because if they had taken off at their normal growth rates they may be in a bit more trouble. "Cool-season crops can tolerate temperatures slightly below freezing. A heavy frost could kill plants however, if the frost isn't removed before those plants receive direct sunlight." Rick added that the cold hasn't been the only thing causing delays. The incredible amount of precipitation that already fallen in the region -- 170% higher than normal since March 1 -- has also caused delays. This, he said, is because gardeners should never work wet soil. While it may all seem like dirt to us, soil has a structure that will be destroyed if it is worked when wet. Getting soil to recover after this abuse, can take years, he said. But, he said, the wet hasn't been as bad as it could have been. "Since the temperature has been lower than normal, it's not such a bad thing. If it was really wet and warm that would be much worse. Also, it's been quite windy, which helped wick moisture from the garden." "Just wait until they're sitting under three inches of snow." It was only about 10 days ago. The warm glow of the sun, the Red Sox assignment of future stars to minor league camp, the bursting forth of herbs from their long (too long) winter naps. Spring was here. I grabbed my shovel and seeds and I headed out to the garden to plant. "It's too early," I was told. "Just wait until they're sitting under three inches of snow." "Ha!" I scoffed, sipping my beer after a long day of digging in the dirt, just as the pangs of muscles I hadn't heard from in months let me know that they, too, were back in action. And the warmth stayed. From Saturday to Sunday and on through the week. In fact, Thursday my onion sets arrived, and I scurried to get them into the ground. After all spring had arrived, and if my onions were to get a full season of the sun's rays and earth's nutrients, I'd better get 'em planted at once. Not to mention, after their long trek from Maine, my little guys deserved some fresh air. I should acknowledge that I had seen Tom Skilling's seven day forecast. I was aware of the blustery threat that weekend rains might just change over to snow. But I discarded them. We'd already passed the threshold of meteorological spring. We'd already blasted into astronomical spring. The days were too long for snow. We'd suffered enough of the white stuff. It was nearly April. Then came Sunday morning. My herbs were buried. The few sprigs of lettuce that had decided to germinate early were covered as well. My glorious daffodils were doubled over by the twin-fisted assault of cold and snow, and my onions, all 107 of them, lined up like toothpick soldiers, had been enveloped by winter's return. "It's poor man's fertilizer," my mother assured me. "This time of year, it doesn't last." She was right. By evening most of the snow had gone, and my onions perked up again. But those lettuce sprouts had receded. My daffodils remained limp. And my cockiness had been tempered. Sunday will be April 4. That night the first game of the Major League Baseball season will pit the World Champion Phillies against the Atlanta Braves. The boys of summer will be back on the field. And here, in Chicagoland, the forecast is rain, possibly changing over to snow.